Paradise Peak is not in the book. It is a seldom visited summit but well worth the visit. 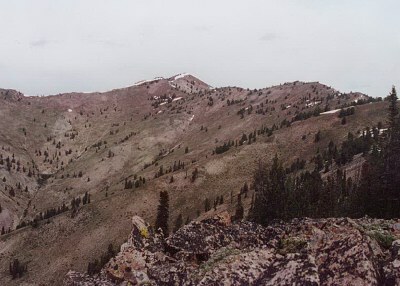 Paradise Peak is one of the more impressive summits in the Smoky Mountain Range but unlike the peaks close to Ketchum it is remote and seldom climbed. The map below show access and route information. 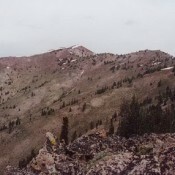 The final stretch of ridge leading to the summit from the south. 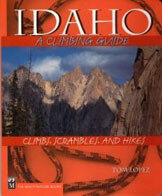 The most direct route is from the South Fork Boise River. [(E)(2.1) page 155] Just past a set of corrals turn onto FS-030. Follow this road to a saddle on the peak’s south ridge. The south ridge is very steep all the way to Elk Point. From Elk Point the ridge moderates somewhat and is easy to follow with only a few obstacles to avoid. Paradise Peak. The black line is the road approach. The red line is the climbing route.